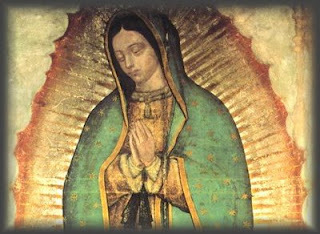 Today, December 12th, is the Feastday of Our Lady of Guadalupe. The fact that the tilma which bears the image is still in existence is itself a miracle. The fabric, made from a cactus plant, has a life of twenty or thirty years. This tunic dates from the early sixteenth century (the apparition took place in 1531). Scientists continue to study the image and the cloth. Kodak of Mexico says that the image is as smooth as a photograph. How can this be? Apparently it is not embedded in the fibres but lies on the top of them. In fact it is possible that the image is not resting on the material but is supended above it, there being only a microscopic gap between the two. This is one of the latest suggestions. Several opthalmists have studied the eyes. The last one to do so found himself speaking to the image as he used the opthalmoscope because, close up, and with the use of such instruments, the eyes seem to be normal and alive. He forgot he was examining a picture and asked Our Lady to "look up"! The more this image is examined the more it looks like proof of the supernatural. Science, rather than disproving the existence of God only seems to make sense if there is a God. In the end scientists will have to kneel in adoration alongside those whom some of them have ridiculed or patronised.